I was a guest on the Reading With Your Kids Podcast with Jedlie. Have a listen as I talk about my books and how they apply to the real world situations kids face every day. Children’s author Angel Krishna writes stories about communication, helping others and believing in yourself. 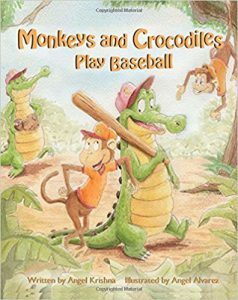 Through her new children’s book Monkeys and Crocodiles Play Baseball, author and fun-loving mom Angel Krishna encourages communication development through relatable jungle friends playing America’s favourite pastime. Angel encourages parents to listen to their children and to communicate with an open mind and a full heart. She reminds herself and those around her to enjoy life, always move forward, and be creative. In this interview, Jed chatted with Angel Krishna to talk about her new books Monkeys and Crocodiles Play Baseball & Gabby’s Space Adventure. Angel also discusses what inspired her to write these stories, why communication is a great skill for children to have and the importance of using your imagination & teaching kids values through books. Stay tuned as Author Angel Krishna takes us through her new children’s books & more. Listen to this episode to find out what Angel Krishna has to say about teaching kids values through books & you will be amazed! 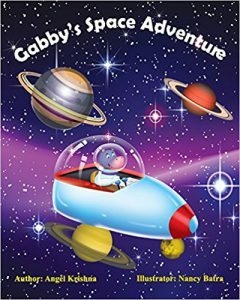 This entry was posted in Gabby's Space Adventure, Guest Posts, Interviews, My Books, Uncategorized and tagged author interview, children's books, communication, education, kidlit, parents, picture books, podcast, reading, teachers, values. Bookmark the permalink.